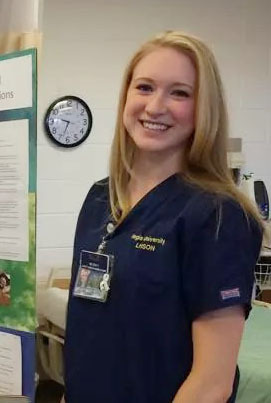 ​The TJ Myrick Memorial Endowed Scholarship at Regis University, Loretta Heights school of nursing, rewards nursing students for their compassion and commitment to the services of others. TJ Myrick, son of Steve and Pam Myrick, suffered an untimely death as a baby. The Myrick’s received support, counsel, and compassion from the Regis University community, where Pam was an employee for 10 years, (1979 thru 1989) especially from Fr. Michael J. Sheeran, S.J., President of Regis at the time. This endowed scholarship is in gratitude to Regis University for all the support and kindness during that very difficult and sad time. The TJ Memorial Fund is honored to sponsor the TJ Myrick Endowed Scholarship for nursing students who dedicate themselves to support, to care for, and to heal, those who are in need. ​My name is Madison Fliedner, but everyone calls me Maddie. I was born in Denver, Colorado and have lived in Colorado my entire life. I want to be a nurse because when I was a kid I lacked courage. I attended a school that labeled me “a slightly slower student”. That label took away all my courage; courage to try new things, courage to push myself into unknown endeavors and courage to show my true self. It wasn’t until my sophomore year of high school that I gained the courage to fight that label and push myself into being the person I am today. One normal Monday, I came home to find my mother doubled over in pain. She pleading to me not to call the ambulance because “it wasn’t that serious”, but I knew I needed to do something. Now, I understand that calling 911 may seem like a small act, but it was the one that saved my mom’s life. 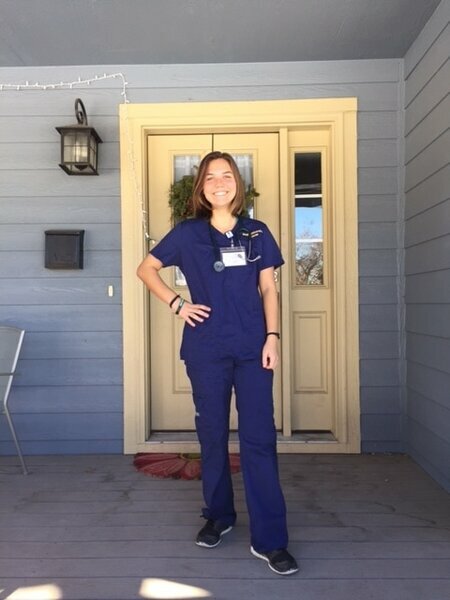 My mother’s spleen had spontaneously ruptured and it was in that moment, when I saw the life in my mom fading away, and I knew I could do something to help that I knew I wanted to be a nurse. I want to help people in their moment of need and to be their advocate when they might not know what is best for them. Ever since attending Regis, I have further confirmed that I am destined to be a nurse. I want to pass on my belief that anyone, even the “slightly slower student” can overcome any boundaries and become the best version of themselves that we establish for ourselves. Winston Churchhill once said, “Success is not final, failure is not fatal, it is the courage to continue that counts.” In my journey to the woman I am today that quote has given me strength. I have failed many times, but with each failure I stand up taller and I succeed greater. I want to pass on to my patients that we are not our labels and we should have the courage to show the world what we are made of – and that it is not flaws or diseases. chaos within my family clouded my thinking. imagine how we could change the world by choosing to lift up those around us that are struggling too. Everything changed within me once I further developed and began to understand this notion. It slowly shaped me and helped me make sense of my own struggles. This is when I inadvertently decided to pursue nursing. The idea of going into a profession and using my knowledge to change the lives of others for the better; that is what began to spark a light in me. The thought of a career in nursing has given me a sense of purpose, knowing that I can make a difference in this world and begin to heal and impact those around me. What a beautiful thought. I hope to pay it forward someday by striving to be a nurse that embodies empathy, compassion, strength, and most importantly one that radiates love for others. Additionally, down the road it is my greatest desire to work with children transitioning out of unstable home environments. My ultimate wish is to show these individuals that hope still exists. I want to be a reminder that they too can escape any adversity and that their current circumstance does not have to be the end. Rather this new transition, in fact, can be where their story begins. It’s where mine did. I grew up in Southern California in a town called Thousand Oaks. I am the youngest of four children and sadly I got to know the Regis Community support best when I too lost a loved one. My older sister passed away the beginning of my Freshman year at Regis due to a drug overdose. I knew at that moment I was lucky to be at Regis because my admissions counselor, teachers and friends were all there supporting me during that time. It really pushed me to want to succeed more not only for myself, but also my family. One of my life goals, is to somehow use my Nursing Major and Sociology Minor to create a non-profit organization to help combat/relieve some of the symptoms that come from substance abuse. I want to be able to support and give tools to the user and the users family. My family also felt that the criminal justice system did not help as well as they could have or at least I felt that way. I want to help somehow impact the medical care, both physical and mental, within the jail system. The transition for my sister and brother, also did drugs but is sober now, coming out of the system was always extremely difficult and stressful for all of us because we never knew what was going to happen next. I want to help make that transition better for people. In my scholarship essay I talked about my grandparents. Another one of my life goals is to be able to start my own family and I really admired their relationship, so I hope that one day I can emulate them in my own relationship. I am currently working two jobs this summer, one at a shaved ice place and the other as a YMCA summer camp counselor! At school I got the position for Coordinator of Weekend Programming in the Office of Student Activities, which I’m really excited for because I’ll get to explore more of Denver while getting paid. ​“They may forget your name, but they will never forget how you made them feel”– Maya Angelou. Nursing, by nature, is a profession of caring and giving to others. Every day they dedicate their lives to save the lives of others. My passion for nursing has always been rooted in caring and giving back to others but in a different form than most nursing majors. My family’s history of military service sparked a passion in me to use my nursing skills and passion to save the lives of those who sacrifice theirs for our country. I also have a deep passion for volunteering and hope to continue to volunteer my services during and after college. I plan to “pay it forward” by caring for veterans and volunteering my nursing skills for the betterment of others. Regis University is renowned for its unmatched nursing education and I’m proud to have been selected to attend nursing school here in order to learn from some of the best. Growing up with a father who served in Vietnam and an extensive familial military service, I developed a deep appreciation for those who serve. One day, I hope to utilize the skills I learn at Regis and become a nurse in the Air Force. I hope to give back by becoming an inflight nurse to save those who are serving our country. I additionally hope to work on base or in the VA hospitals to “pay it forward” to not only those who are serving but for those who have served and their families. Military families and our veterans give so much more than they receive credit for and I hope to one day say thank you through offering the best care I can. I believe that serving for those who have served, like my father, is the best way to give back to those who have given for us. I also plan to pay it forward by continuing to volunteer. Attending a Jesuit High School, I was exposed to the Jesuit values. One that always spoke to me was “men and women in service of others.” This compelled me to volunteer at the Shriners Children’s Hospital during high school to continue my passion for working in a hospital and care for patients and their families in hopes of making their stay a little brighter. I plan to continue to volunteer my nursing skills and time to better the lives of others. Nursing takes care and passion, it is the profession of giving. I hope to pay it forward to those who have given to me by using the talents and skills I have learned at Regis to give back. I hope to work to save the lives of those who have sacrificed theirs for the protection of our country. I also plan to pay it forward by volunteering to care for and better the lives of patients and their families. Nursing and caring for others has always been my passion, and I hope to use it one day to give back to those who have contributed to my life and to spread that care to others.